New York City is my hometown, and the center of my heart’s geography. My love for Whitman and his work comes from many places, but most directly from our shared love of this one place (or several places, depending upon how you feel about Brooklyn’s “big mistake” to become a borough of NYC in 1898). Both of us were “born” here (in the literary sense for Walt; literally for me), sang on the (omni)buses and swam in its waters (no kidding); we both find the best of what civilization can accomplish on its streets—always and ever new identities meanings signs curiosities faces pageants smells visions fears hopes and love. Both of us, I think, found something spiritual in its raw and undeniable physicality. And so when I teach a class on Whitman, I find that I must take my students out of the classroom and into New York to answer the big question: how did Walter Whitman—second son of a carpenter, grammar school dropout and sometime penny daily hack writer—become Walt Whitman? It’s my belief that “Walt Whitman, a kosmos, of Manhattan the son” was indeed the product of his immediate environment and experience; and it is my aim to introduce my students to a real New Yorker in his beloved Brooklyn and Manhattan, and to have them see, hear, and sense the urban setting that transformed a sensitive young man into America’s greatest poet. The open road of his poetry is, in fact, the city street—and we explore this idea through texts as well as walking tours. The most important of these dwellings just happens to be the only one still standing: 99 Ryerson Street, the house in which Whitman finished the first edition of Leaves of Grass in 1855. And that’s the goal of this pilgrimage, though we have some sightseeing to do first. Directly ahead of us spreads the 30 acres of Fort Greene Park, established as Brooklyn’s first official park in 1847 largely because of Whitman’s almost-daily newspaper editorials calling for a “lung” in his rapidly developing neighborhood. We stroll around this well-used green, which may well have have inspired the “Leaves of Grass” completed just a few blocks east. In the past few years, we have been joined here by Greg Trupiano, legendary Director of the Whitman Project and perhaps the best living representative I know of Walt’s generous spirit and “urban affection.” Greg provides a lively, entertaining history of the Revolutionary War Martyr’s Monument and Tomb—projects very dear to Walt’s heart, though these magnificent structures were completed 16 years after his death. Standing at Brooklyn’s highest point (right at the base of the Monument), we peruse Whitman’s Brooklyn, Wallabout Bay, the East River and his beloved Mannahatta—all from a vantage point that was likely one of Walt’s favorite perches. Our walk continues down the now omnibus-less Myrtle Avenue (passing the site of the offices of Whitman’s Brooklyn Freeman) on our way home to Walt’s house at 99 Ryerson. I want students to experience how Whitman’s daily walks here in 1855 fed the developing project of the Leaves. Myrtle Avenue is still a lively commercial thoroughfare; and just as Whitman enjoyed window-shopping at Joseph Muchmore’s china shop (at #37), we take in the diverse goods and products on display at Kiini Ubura Jewelry or, well, Karen’s Body Beautiful. Many of the two-story storefronts have been standing since Walt took this daily walk in 1855, coming home from working on the Leaves. After an especially exhausting mission—and if his wallet permitted—Walt could’ve taken the Myrtle Avenue car line, which began operation in July 1854. Husted & Kendall’s fleet of 16 cars made the journey from the Fulton Ferry to the Franklin Hotel on Broadway (well into BedStuy), sparing Whitman the walk we were enjoying. We make a left on Ryerson Street, and discuss the reaction of Whitman’s visitors to this “street of mechanics’ homes.” The street vibe hasn’t changed all that much: these are the dwellings of hard-working Brooklynites—mechanics and students and local shop owners—who live with the constant roar of the BQE (elevated just north or Myrtle)… and the ghost of America’s greatest poet. “Walt Whitman, A Brooklyn Boy”? Had Emerson actually walked up this plain and solid stoop, to search for the author of Leaves of Grass? Had Thoreau really stood underneath the now missing wooden canopy, waiting to discuss Walt’s big green book? If Whitman is the poet of place, then we felt we were at the Whitmanic Navel. “Who are you looking for?” came a voice from a big brown car parked out front of the house. It didn’t take long for me to answer. “Well, he lived here, you know.” The congenial Brooklynite turned out to be the owner of the building. After hearing about our pilgrimage, and smiling at the enthusiasm on our faces, he opened his heart– and his home, to us. Without hesitation, he ushered all 26 of us through the ground floor entrance and up the staircases that Walt daily ascended and descended from May through November 1855. My feet strike an apex of the apices of the stairs, I whisper. On every step bunches of ages, and larger bunches between the steps; all below duly travel’d, and still I mount and mount. Who was to know what should come home to me? Who knows but I am enjoying this? Who knows, Walt, for all the distance, but I am as good as looking at you now, for all you cannot see me? We could see Walt walking through this doorway and heading for the Rome Printing Shop as he had 153 years ago, on July 4, 1855. By then, the two-mile jaunt was a familiar one: since May, Walt had been working side by side with brothers Thomas and Andrew Rome, Scottish immigrants who had set up their small shop just off Fulton Street. Together, the three business partners and friends composed, proofed, and edited the twelve revolutionary poems that other printers had declared too radical to print. In the last few weeks, Whitman had added a double-columned, ten page prose preface that gave this singular book the feel of a manifesto. And that it was. As he left this house that fourth of July, Whitman knew he was putting the finishing touches on America’s declaration of cultural independence. 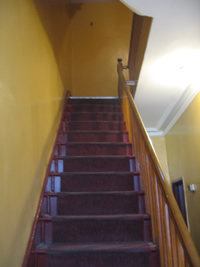 Though the house is now divided up into smaller apartments (Pratt students and recent immigrants now live in closer quarters than the Whitman family did), the spirit of the house still felt broad, muscular— “braced in the beams.” I felt the solidity and soundess of the construction as I grasped the generous wooden banister and climbed the good-sized stairs. Walt is here. In the floorboards, the doorknobs, the old float-glass window panes. And in our faces as we passed through this magical place. My feet strike an apex of the apices of the stairs, I whisper. On every step bunches o fages, and larger bunches between the steps; all below duly travel’d, and still I mount and mount. I still see Walt descending these stairs, walking through the doorway and heading south down Ryerson towards the Rome Printing Shop, just as he had 153 years ago on July 4, 1855. By then, the two-mile jaunt was a familiar one: since May, Walt had been working side by side with brothers Thomas and Andrew Rome, Scottish immigrants who had set up their small shop just off Fulton Street. Together, the three business partners and friends composed, proofed, and edited the twelve revolutionary poems that other printers had declared too radical to print. In the last few weeks, Whitman had added a double-columned, ten page prose preface that gave this singular book the feel of a manifesto. And that it was. As he left this house that fourth of July, Whitman knew he was putting the finishing touches on America’s declaration of cultural independence.